Customers at a dollar store in Charlotte Hall, Maryland, were shocked to find a furry brown animal scurry across the tile floor straight into the holiday section on Monday. It looked like the suspect, quickly identified as a beaver — paddle-shaped tail and all, knew exactly where he was going. The creature searched and searched until finally, he saw what he was looking for: trees. Well, artificial ones, at least. Corporal Julie Yingling from the St. Mary’s County Sheriff’s Office got a good chuckle when she arrived on scene. The beaver was caught standing on its hind legs with his paws resting on a 6-foot artificial Christmas tree complete with twinkling lights, leaving a trail of trash and empty boxes on the floor behind him. The suspect, who caused “property damage,” attempted to flee the area but was apprehended by Animal Control, St. Mary’s County Sheriff’s Office said in a statement on Thursday. Photos of the beaver’s shenanigans quickly went viral on social media with nearly 3,000 shares on St. Mary’s County Sheriff’s Office’s Facebook page. 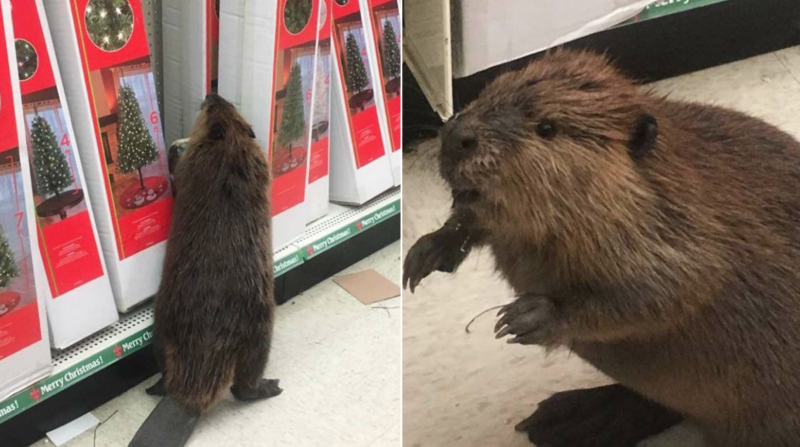 Unfortunately for this beaver, his shopping trip was cut short, but here’s to hoping the little guy finds a real tree to chew on. “As a law enforcement officer, you just never know what your next call may be,” the sheriff’s office joked.